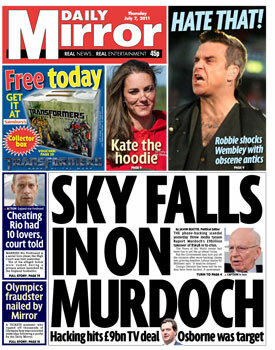 There is a huge scandal involving Rupert Murdoch, chairman of News Corp (the parent company of Fox News). 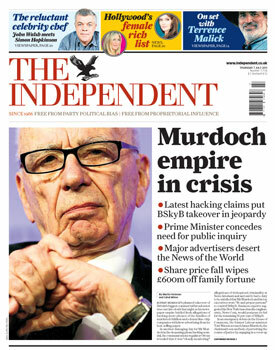 Due to the scandal, News Corp's stock has fallen 3.6% ($1.7 bn of its value lost). 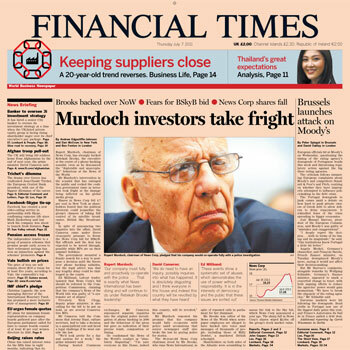 Rupert Murdoch, chairman of News Corp, has strongly backed Rebekah Brooks, the executive at the centre of a phone-hacking scandal, even as he denounced the “deplorable and unacceptable” behaviour at the News of the World. 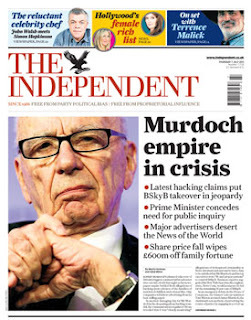 Mr Murdoch’s intervention in the scandal that has outraged the public and rocked the coalition government came as investors took fright at the damage being inflicted on his global media group. Shares in News Corp fell 3.6 per cent in New York as shareholders feared that the political firestorm could jeopardise the group’s chances of taking full control of its satellite broadcaster, British Sky Broadcasting. In spite of announcing two enquiries into the affair, David Cameron came under fierce cross-party pressure to freeze the News Corp bid for BSkyB. But officials said the deal was expected to be waved through, possibly while MPs are on their summer holidays. 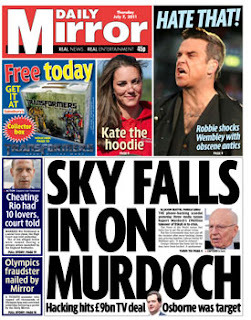 The government mounted a frantic search for a way to postpone a decision until the furore over phone hacking subsides, but the legal advice was that any long delay could be challenged in the courts.